Not to pour it on too much, but if one wants to compare the two CE884's from post #4, the entry for Station# 3.29.2 = Z161 in one chart, and z168 for the other. 6.986 frames = frame difference between Z161 and z168 or as they say " close enough for government work". The limo travels 2.4ft in 5frames according to the extant zfilm. 8.8 vs 8.78 Close enough for gubermint work. 3.66 x 2.41 = 8.82ft /1.2596 ft per frame (15.68mph) = 7.002 frames. See previous post. Previously described and put into context. Combined, look back up Elm St.
Hopefully you found the 61ft designation. What constitutes 13.54 vertical inches? 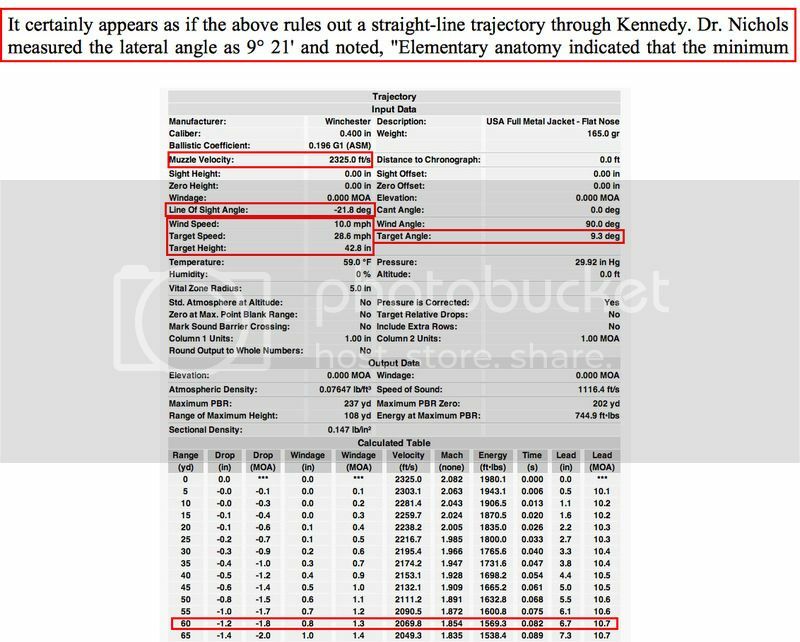 The first part would be the WC determination of JFK's head height at the time of the extant 313 headshot. This difference is used in all entries on CE884. 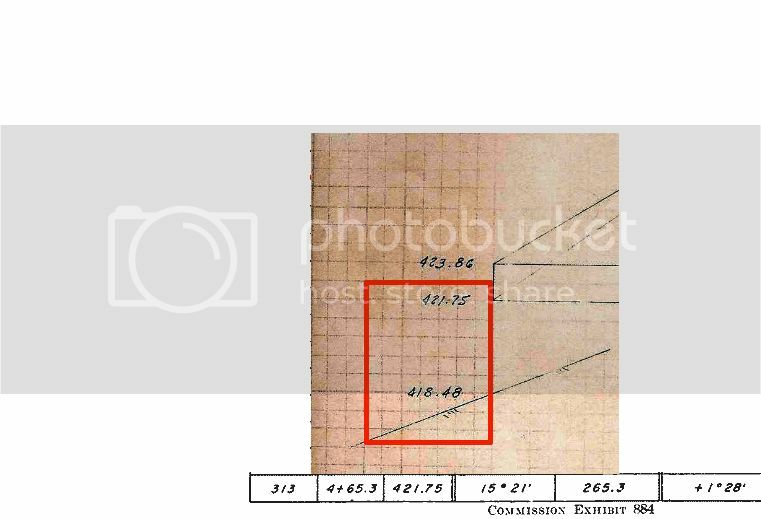 At 3.27ft above the street, which is what the WC determined JFK's head height to be for all CE884 entries, this converts quite closely to an Elm St elevation change of 61ft. I will introduce the slight WC adjustment between the two a little later. 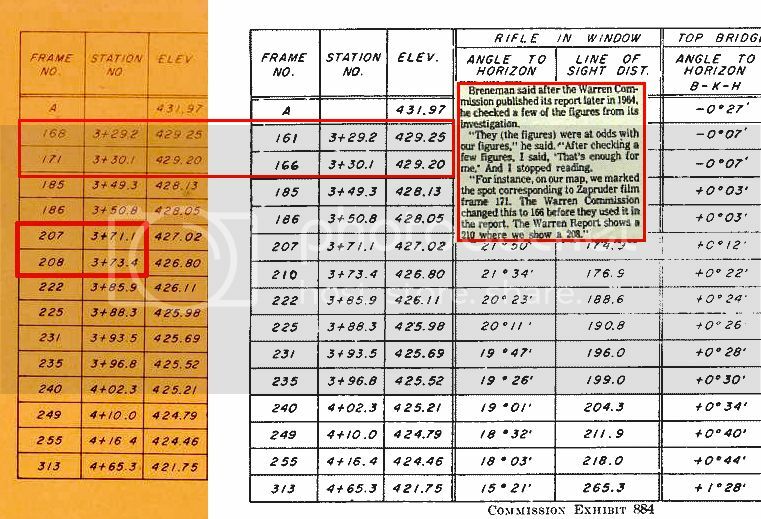 The 163.65ft flatline distance would equate to JFK's physical location(Station#3+71.1) within the limo at extant zframe 207. Sorry, back or throat I'm not concerned with at this time. 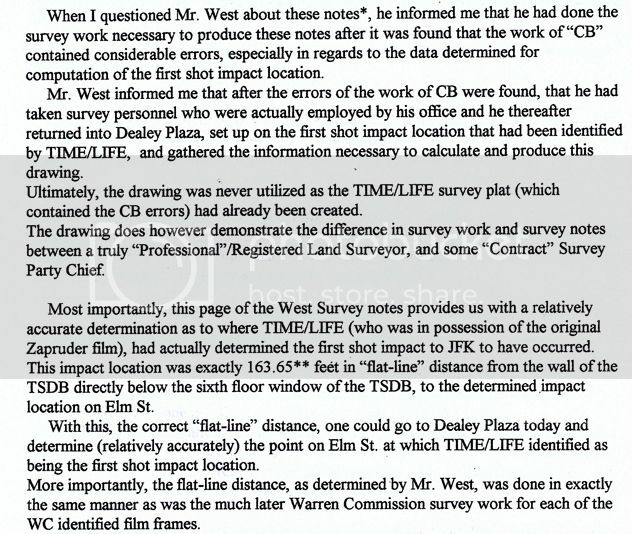 More support for Robert West's Time/Life documentation. The "Speed of Car" entry reflects the distance (90ft) between two shots corresponding back to extant Z207-Z313 from CE884. In terms of frame count between the above scenarios, the difference would equal one frame. It appears someone knew the significance of a 2" lead. 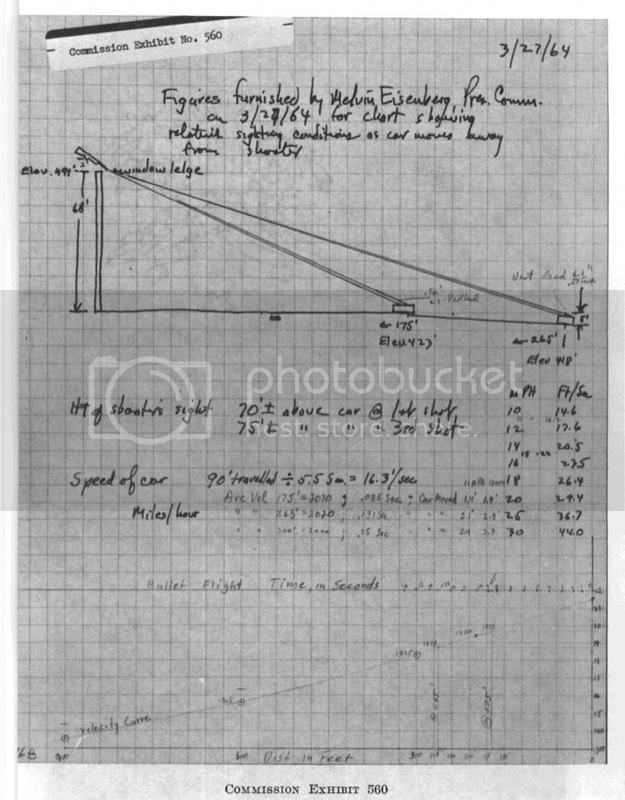 Mr. EISENBERG - And you calculated the speed of the car by translating the figures on total time elapsed between first and third shots? Mr. FRAZIER - Yes, sir. The time the speed of the moving object was calculated on the basis of an assumed 5.5-second interval for a distance of 90 feet, which figures out mathematically to be 11.3 miles per hour. Mr. EISENBERG - Now, you said before that in order to give this 2-foot lead, you would have to aim 2 inches--for a target going away from you, you would have to aim 2 inches above the target, or in front of the target. Mr. FRAZIER - 2 feet in front of the target, which would interpolate into a much lower actual elevation change. Mr. EISENBERG - The elevation change would be 2 inches, is that it? Mr. FRAZIER - Well, no. It would be on the order of 6 to 8 inches. Mr. EISENBERG - 6 to 8 inches? Mr. EISENBERG - What was your 2-inch figure? Mr. FRAZIER - I don't recall. Mr. EISENBERG - But it is 6 to 8 inches in elevation? Representative BOGGS - May I ask a question? Using that telescopic lens, how would you aim that rifle to achieve that distinction? Mr. FRAZIER - Well it would be necessary to hold the crosshairs an estimated distance off the target, of say, 6 inches over the intended, target, so what when the shot was fired the crosshairs should be located about 6 inches over your target, and in the length of time that the bullet was in the air and the length of time the object was moving, the object would move into actually, the path of the bullet in approximately 1/10th to 13/100ths of a second. Mr. EISENBERG - So that if the target of the assassin was the center of the President's head, and he wanted to give a correct lead, where would he have aimed, if we eliminate the possibility of errors introduced by other factors? 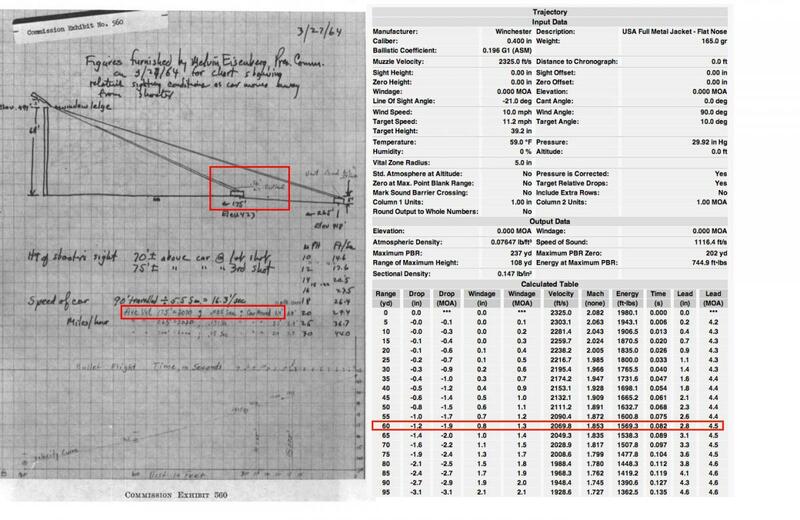 Mr. FRAZIER - He would aim from 4 to 6 inches--approximately 2 inches, I would say, above the President's head, which would be actually 6 inches above his aiming point at the center of the head. Mr. EISENBERG - How difficult is it to give this--a lead of this size to this type of target? 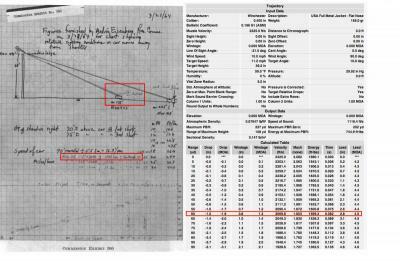 Mr. FRAZIER - It would not be difficult at all with a telescopic sight, because your target is enlarged four times, and you can estimate very quickly in a telescopic sight, inches or feet or lead of any desired amount. Mr. EISENBERG - Would it be substantially easier than it would be with an open or peep sight? Mr. FRAZIER - Yes. It would be much more difficult to do with the open iron sights, the notched rear sight and the blade front sight, which is on Exhibit 139. Mr. EISENBERG - Now, you have been able to calculate the precise amount of lead which should be given, because you have been given figures. If you had been in the assassin's position, and were attempting to give a correct lead, what lead do you think you would have estimated as being the necessary lead? Mr. FRAZIER - It would have been a very small amount, in the neighborhood of a 3-inch lead. Mr. EISENBERG - As opposed to the 6 or 8 inches? Mr. FRAZIER - As opposed to about 6 inches, yes. Mr. EISENBERG - What would the consequence of the mistake in assumption as to lead be that is, if you gave a 3-inch lead rather than the correct lead? Mr. FRAZIER - It would be a difference of a 3-inch variation in the point of impact on the target. Mr. EISENBERG - Now, if you had aimed at the center of the President's head, and given a 3-inch lead, again eliminating other errors, where would you have hit, if you hit accurately? 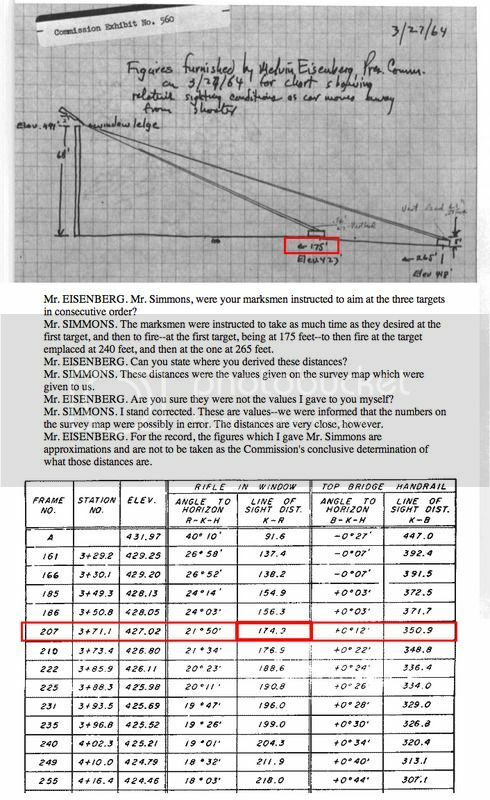 Mr. FRAZIER - It would be 3 inches below the center of his head--from the top--it would be not the actual Center from the back, but the center would be located high. The bullet would strike at possibly the base of the skull. Mr. EISENBERG - Now, suppose you had given no lead at all and aimed at that target and aimed accurately. Where would the bullet have hit? Mr. FRAZIER - It would hit the base of the neck--approximately 6 inches below the center of the heart. Mr. EISENBERG - Mr. Frazier, would you have tried to give a lead at all, if you had been in that position? Mr. FRAZIER - At that range, at that distance, 175 to 265 feet, with this rifle and that telescopic sight, I would not have allowed any lead--I would not have made any correction for lead merely to hit a target of that size. The excerpt at top, within the graphic, is from a review article by Martin Hay. The link is included if you want to read the whole article. The ballistic results pretty much bear out what I've provided in the previous postings in relation to extant z207, CE560 and testimony thus far. We now know mathematically what 4 inches represents. Bennett translation: Two shots occurred (before the extant 313 shot) in less time than is possible, to fire the same weapon. The SS giveth, the WC taketh away. Air Force Two landed at Love Field, Dallas, Texas at 11:35 A.M. Upon deplaning, I covered the fence and press areas. The President's plane arrived at approximately 11 :38 A.M. I stayed with the President and First Lady during the time they greeted the crowd on the apron and along the fence. The greeting lasted for about 10 minutes and the President/First LadyENTERED their car and the motorcade planned to depart. I asked while moving towards the follow-up car what position I should take, Mr. Roberts informed me that I should take the right rear seat of the follow-up. I took this position and held it during the entire motorcade. I left this rear seat position at one point in the trip to assist in getting well-wishers away from the President's auto. About thirty minutes after leaving Love Field about 12:25 P.M., the Motorcade entered an intersection and then proceeded down a grade. At this point the well-wishers numbered but a few; the motorcadeCONTINUED down this grade enroute to the Trade Mart. At this point I heard what_sounded like a fire-cracker. I immediately looked from the right/crowd/physical area/and looked towards the President who was seated in the right rear seat of his limousine open convertible. At the moment I looked at the back of the President I heard another fire-cracker noise and saw the shot hit the President about four inches down from the right shoulder. A second shot followed immediately and hit the right rear high of the President's head. I immediately hollered "he's hit'' and reached for the AR-15 located on the floor of the rear seat.SPECIAL Agent Hickey had already picked-up the AR-I5. We peered towards the rear and particularly the right side of the area. I had drawn my revolver when I saw S/A Hickey had the AR15. I was unable to see anything or one that could have fired the shots. The President's car immediately kicked into high gear and the follow-up car followed. The President's auto and the follow-up proceeded to the Parkland Hospital. Upon arriving at the hospital's parking lot, I was instructed by ASAIC Roberts to stay with the Vice-President who had followed us into the parking lot. I immediately went to the Vice-President's auto and accompanied him to a room on the ground floor of the hospital. I then continued with the Vice-President back to Washington, D.C. where I was relieved.